This piece is made using satinique cord. 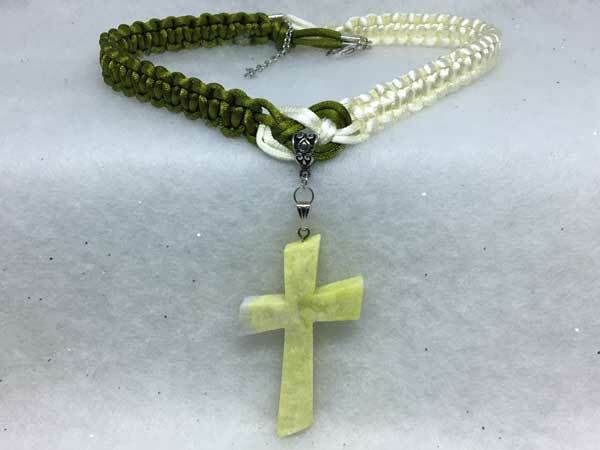 It is done in shimmery ivory and olive green, and adjusts in length from 16.5 to 19.5 inches, with a center jeweled piece that adds almost 3.5 inches. The jeweled piece stands alone in all of it's glory as a large, angled stone cross in shades of pale chartreusse. This cross is so beautiful, that I chose not to have it compete with any other beads.